What does water, yeast, salt, flour and a zip-lock bag make? Bread, of course! It was a thrilling culinary adventure for our Early Education preschoolers who recently made bread with Luke Lopez, a Culinary Arts Junior and Early Education Juniors, Madi Martini, Emma Monahan and Kylie Peltier. Baking bread with preschoolers gives them a sensory experience, math experience, language experience, and science – a true learning opportunity. In a world where prepared food seems to be the norm, it's good for kids to know that something, even as basic as bread, comes from somewhere before it goes to the store. After making the bread, the preschoolers were able to “purchase” the bread from the bakery for a penny. 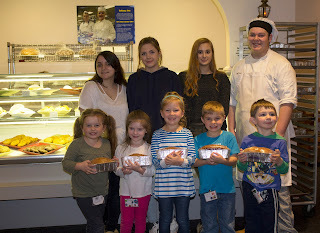 Fun was had by all as the kids were super-excited to receive their breads and take them home to share with their families!